Interesting fact for you. This was the second tutorial I filmed for the SpringWatch series, but it’s coming out as the 8th project! I filmed all 14 and then took all the photographs, but it was after I’d completed it all before I chose the ‘running order’ of how they were all going to be set. So when I was deciding on what I was going to make, which was obviously before I filmed anything, I’d just completed what felt like loads of ‘little’ bags and boxes, so I came in with a biggie, and then it just all went out the window with wanting to put Birthday Bash in last week…. Oh well! We got there in the end! 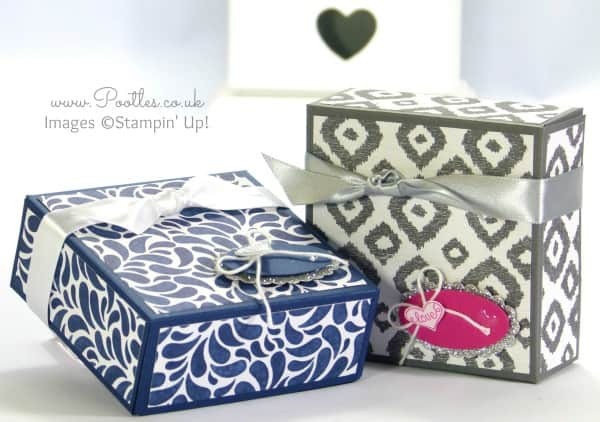 My boyish box shows off the Birthday Bash and Sweet Dreams Papers. I don’t think the blue looks particularly birthdayish and the grey certainly doesn’t immediately make me think of newborn baby. I dunno, maybe it’s just me??? ?